It is still raining. All being considered this shouldn’t be a surprise to anyone. After all it is North Devon, it is autumn and I have a lingering Hammer House of Horrors cough to nurture. Mr and Mrs G swanned off first thing telling me they had a very important meeting to attend, leaving myself and Slasher in charge. There were many apologies and heart felt regrets that they would not be able to assist us today, there may well have been tears. Instead they would be having an absolutely dreadful time in the warm dry “lunch included” meeting. They leapt onto the No. 1 “going out to meetings and other important events” tractor and waved farewell. I swear I heard Mrs G shout “QUICK DRIVE!” as they slowly screeched off into the distance. Poor things, I thought as I stood alone in the drizzle. Today, I decided, would be an excellent day to tackle the problem of the long raised bed. This bed is very long. I wish I had paced it out to give you some detailed information but I imagine that more accurately it would be regarded as very, very, long. To accentuate this longicity it is also rather narrow, probably less than 2m wide. The mythical previous owners had planted this raised bed with some very unsavoury characters. These plants are not only invasive but, far worse and almost unforgivable, they are extremely dull. “Walk past and not notice” tedious. “Nod off half way through the conversation” boring. I had been promised that Slasher could be my slave for the day (although I had been denied the badge that I wanted him to wear). As always he seemed keen to help. That lad has a very short memory. So we began, SS attacking some particularly gruesome grass with all the grace and elegance of a brick (not SS you must understand, the grass. SS is very elegant). I was tackling one of the islands of Jerusalem artichoke, with its creamy quick release tubers, which didn’t even have the decency to flower this year. As we worked we chatted about the joys of working outside, even when the weather was inclement. We mocked the soft-handed office folk, we chortled about how a little bit of wet never hurt anyone. As if testing our resolve the rain got steadily heavier, the wind stronger and gustier. The persistent downpouring had found a weak link in my armour, discovering a gap where a gap should not be. There was the sound of dripping water, from nose, sleeve and ankle. A morass was beginning to form, the bed was fighting back. Eventually we looked at each other “a bit heavy now don’t you think” and ran for cover. Discretion truly is the better part of valour. Should have stayed home and done housework! It does look like a very appropriate toffee apple! 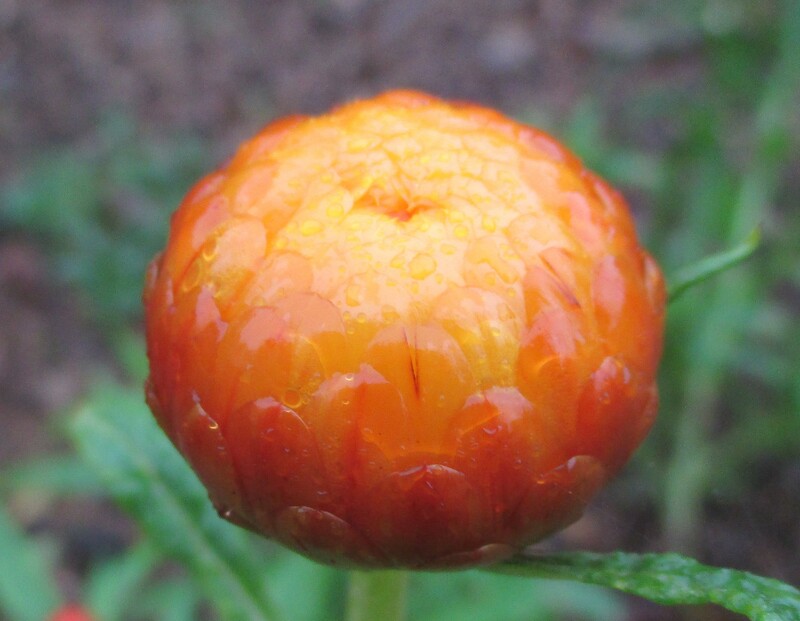 In fact it is the flower bud of an everlasting flower. Housework tomorrow I fear …..
Ah, the lot of the professional gardener. I’ve experienced this kind of weather in my own garden, but always have the option of giving up. After all, there are no witnesses to my own gardening activities. I’m curious, though–did the spell checker give you any warnings about the word “longicity”? No problem, it worked to hilarious advantage in context. Longicity, I think you may have invented a very good new word – it certainly fits the description of the border! May the rain go away soon and give us all some more of that lovely gardening weather. There is something very stiff-upper-lip-ish in the length of time you continued to brave the elements before finally realising ……You should still be tucked up with hotwaterbottle…after your Poorliness …I would have taken one distant shufti and disappeared under the duvet. You and SS really are made of sterner stuff. Hope the weather clears up soon. It was a case of I didn’t want to chicken out first, so childish! Sorry it did rain on you, again. I know that look, seconds before starting to run for cover! You need to stay in, you’ll just get even more ill. Are you wearing a vest? I am inside today and wearing a vest, see how I do as I’m told! Ahh—longicity–now I must find a way to use it. The British language is constantly evolving, seemingly with words bandied around by youngun’s, it needs creative folk of the slightly more experienced ilk like you to add our own creations. Well done. Love the mocking of the officebound folk, while you enjoy the delights of an English Autumn, truly heroic stuff. As was the use of ‘longicity’.